Madi helping Blakely students at Heyday Farm to seed greens that will be starters raised in the greenhouse. As an educator, I can say there is nothing better than witnessing an “ah ha” moment. On the farm, that moment can come in any shape or form, but is always a beautiful thing. Here are a few that I have recently experienced. During these activities, we like to narrate the tasting experience. What the students are eating is a piece of Bainbridge, a piece of their homeland, and no other berry will be just like that one. Place and taste. Another moment I recall was after a long hot, sunny day spent planting potatoes. It was time to hike back up the hill from Morales Farm to Suyematsu, and you could hear murmurs throughout the line, with kids saying, “Geez – farming is hard.” Ah ha; an appreciation for small, sustainable farming. One instance I remember occurred as I was giving a lesson on the importance of bees and pollination to our food system. As I pointed to a “bee” that was “pollinating” as we watched, a little voice chimed in from the back. That was an “ah ha” moment for me; know your audience. 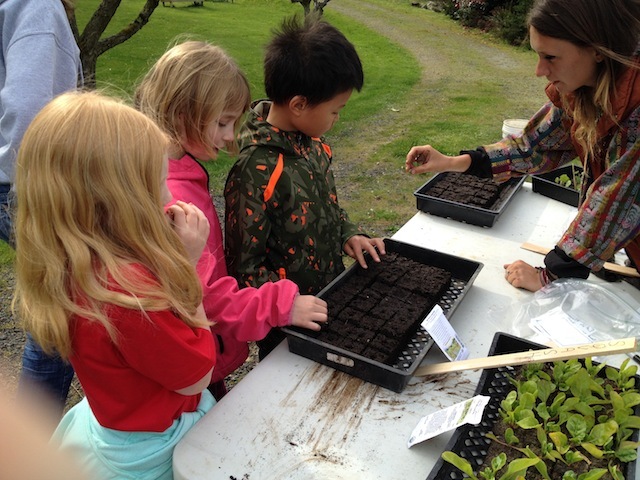 Bainbridge Islanders are very fortunate to live in a community that shares space so closely with small farms. This is sometimes very apparent in the classes we teach and I continuously learn new things from every class. 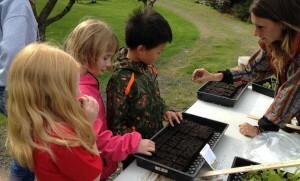 Beyond lectures and curriculum and attempts to enable more transparency within our food system, there is simply kids outside, learning in a way that can’t be done in the classroom or from a computer or iPad. They are trudging through tall grass, getting their hands dirty, and yelling “POOP!” as loudly as they can (in our defense, we were teaching them about the circulatory system at Heyday Farm and the importance of manure in a working farm). The most important part is the experience. These kids will grow up with memories of field trips to the farm and of a strawberry that was so good, it almost brought them to tears. Farms are where food comes from. Not grocery stores, not factories, but from the hard work of local farmers. To many people, that fact might be an “ah ha” moment. At EduCulture, we simply want that relationship and connection to exist. Our students will always know where their food really comes from. Madison Taylor previously worked as an Intern with EduCulture and in the spring 2014 season began leading classes at all levels. She brings a variety of international teaching and volunteer experiences to her work. Madison has served as a volunteer for International Volunteer Headquarters (IVHQ) in Costa Rica and as a Sustainability and Community Building Ambassador for Peace Trees, Vietnam. She graduated from the University of Washington with a B.A. in Anthropology, a B.A. in Comparitive History of Ideas, and a Human Rights Minor. During that time she studied abroad in both Italy and Vietnam, with a focus on sustainable food systems, food politics, and international development. Madison has also participated in the Slow Food Movement’s Terra Madre Convention in Turin, Italy. This entry was posted in Uncategorized by Cindy Vandersluis. Bookmark the permalink.